Images of the final death throes of the largest known star in the Universe have been taken by a team of international astronomers as part of the VPHAS+ survey of our Galaxy led by my colleague Professor Janet Drew at the University of Hertfordshire’s Centre for Astrophysics Research. The discovery, as just published in the Monthly Notices of the Royal Astronomical Society, is a vital step in understanding how massive stars return enriched material to the interstellar medium (the space between stars) which is necessary for forming new planetary systems. 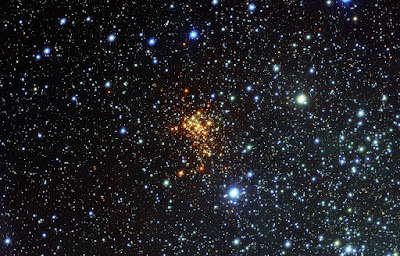 Stars with masses tens of times larger than that of the Sun live very short and dramatic lives compared to smaller stars. Some of the most massive stars have lifetimes of less than a few million years before they exhaust their nuclear fuel and explode as supernovae. At the very ends of their lives these stars become highly unstable and eject considerable material from their outer envelopes. This material has been enriched by nuclear reactions deep within the star and includes many of the elements necessary for forming rocky planets like our Earth, such as silicon and magnesium, and which are also the basis for life. Using the VLT Survey Telescope (VST) based in Chile, the VPHAS+ survey has been searching our Galaxy for ejected material from evolved stars and we were very excited by what we saw when observing the super star cluster Westerlund 1. 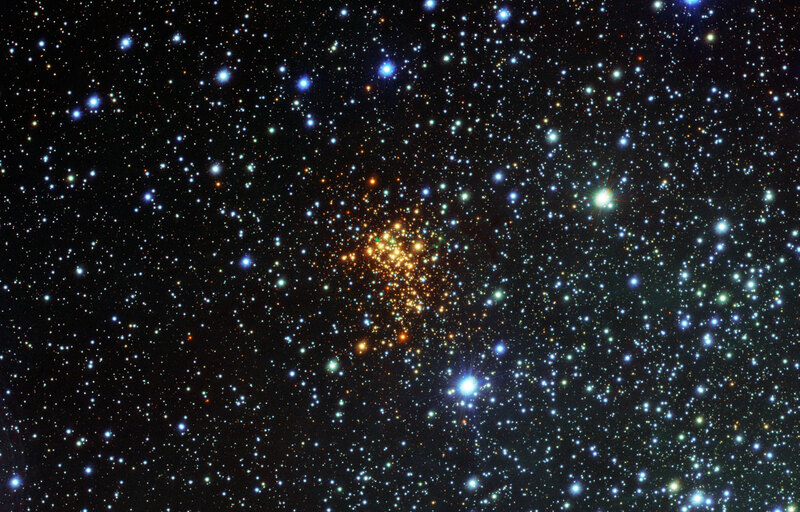 Westerlund 1 is the most massive cluster of stars in our Galaxy, home to several hundreds of thousands of stars, and about 16,000 light years from Earth in the southern constellation of Ara (The Altar). When we studied the images of Westerlund 1, we spotted something truly unique. Around one of the stars, known as W26, we saw a huge cloud of glowing hydrogen gas, shown as green in this new image. Such glowing clouds around massive stars are very rare, and are even rarer around red supergiants such as W26 — this is the first ionised nebula ever discovered around such a star. On investigating the star W26 in more detail, we realised that the star was probably the largest star ever discovered with a radius 1500 times larger than that of our Sun, and one of the most luminous red supergiants known. Such large and luminous massive stars are believed to be highly evolved, all of which suggests that W26 is coming towards the end of its life and will eventually explode as a supernova. The paper, ‘The ionized nebula surrounding the red supergiant W26 in Westerlund 1’, is published in the Monthly Notices of the Royal Astronomical Society.